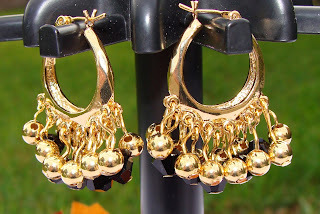 These gold plated brass hoop earrings are designed with seventeen loops and hold these beautiful black swarovski crystal beads and gold plated round beads. Fashionable, lovely, flirty and fun. Because of their great wardrobe versatility, you'll be wearing these a lot. They measure one and a half inches. Great gift idea for anyone-anytime. What Makes you Remember Freedom? Elephant Shoes Knits: 2 New Shoes!!! !